Matheus Leist will join A.J. Foyt Racing president Larry Foyt, center, and fellow Brazilian driver Tony Kanaan next season. The latter location is the hometown of Matheus Leist, named last week to wheel the No. 4 ABC Supply Chevrolet in the Verizon IndyCar Series beginning in 2018. Leist, 19, will team with fellow-Brazilian Tony Kanaan, who signed with Foyt’s family-run organization on Oct. 6 after spending the last four seasons with Chip Ganassi Racing. Kanaan and Leist replace American Conor Daly and Carlos Munoz of Colombia, a pair of 25-year-olds who finished underwhelming seasons in Foyt’s No. 4 and No. 14 Chevrolet-powered entries, respectively. 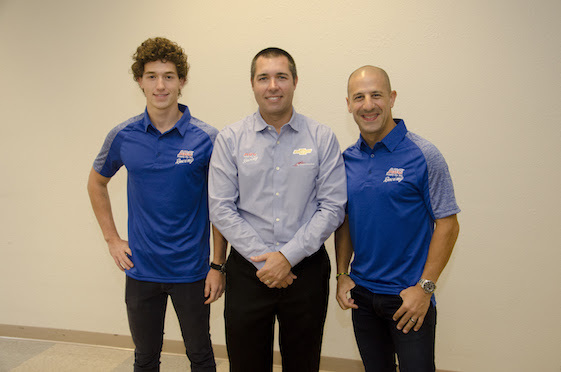 Currently the youngest fulltime driver in the series, Leist will be paired with the series’ most experienced driver in Kanaan, who will be entering his 21st season of Indy car competition. Leist will compete in America’s premier open-wheel series after one year in the Indy Lights presented by Cooper Tires Series where he won three races, two of which were sweeps. Leist won pole position and the race at two of this country’s most historic tracks _ Indianapolis Motor Speedway and Road America. As noted by Foyt, Leist’s first major victory in the United States came in the Freedom 100 at IMS, more notable because it was his first experience in oval track racing. At Road America, Leist won the first race of a double-header. His third win was scored on Iowa Speedway’s short oval. The three tracks epitomize the diversity of the series _ superspeedway, road course, short oval. In four starts on the series’ two street courses (St. Petersburg, Fla., and Toronto), his best finish is fifth. Like the ovals, it was his first experience on temporary circuits. Leist’s graduation into INDYCAR was preceded by his championship performance in the British Formula 3 Series, where he posted four victories and seven podium finishes. The championship came down to the wire, with Leist securing the title from series leader Ricky Collard in the final race. It was after winning that title in 2016 that he decided to pursue a career in America. “I’ve been racing for 11 years so far, and since I started in 2006, my brother and I always dreamed about getting into a top category,” Leist said. “I’m so thankful for the opportunities that I had so far and for the big moments that I lived. Every day I keep telling myself that I couldn’t have made a better decision than to come to the USA at the end of 2016. America is where things happen and where the good drivers have a proper place. Kanaan, the self-described “last man standing” in the Verizon IndyCar Series, signed a multi-year contract with the team fronted by Foyt, the first four-time Indianapolis 500 champion. Kanaan won the Indy 500 in 2013 driving for KV Racing Technology and the 2004 series championship with Andretti Green Racing. Kanaan’s signing marked the first time “Super Tex” hired an existing Indy 500 champion for a full season drive other than himself. Foyt owned the team when he won his third and fourth Indianapolis 500s in 1967 and 1977, respectively. Kanaan, who raced alongside four-time series champion Scott Dixon, will be reunited with Technical Director Eric Cowdin. Kanaan and Cowdin collaborated on a number of significant achievements in the Brazilian’s career, including his Indy 500 victory, 2004 series title and 15 of his 17 victories. Larry Foyt, team president and A.J.’s son, classified the complete change of drivers as one of several “tough decisions” made to strengthen the overall program. Kanaan is scheduled to run a manufacturer’s test of the new universal aero kit next month at Sebring International Raceway in Florida, while Leist is booked to test the new car in early January, also at Sebring. Kanaan and Leist will test together there at the end of January. The Verizon IndyCar Series will kick off its season with the Firestone Grand Prix at St. Petersburg on March 11. Ed Jones, the Verizon IndyCar Series’ Rookie of the Year, has brought an appreciation of open-wheel history to his new job as teammate to four-time champion Scott Dixon on Chip Ganassi Racing’s downsized, two-car team for 2018. Jones, who competed for Dale Coyne Racing in 2017, will drive the No. 10 NTT DATA Honda beginning in 2018. “It’s a great honor to be part of Chip Ganassi Racing for the 2018 season. It’s a fantastic opportunity,” said Jones, whose hiring was announced on Oct. 25. “I’m just going to love being part of the No. 10 car. What a fantastic history that’s been with drivers like Dan Wheldon, Dario Franchitti at the (Indianapolis) 500. “It’s going to be great to get going. Really looking forward to it for a long time now. Just trying to do everything we can to prepare as well as possible. Yeah, have a great time next year. A 24-year-old Englishman living in Dubai, United Arab Emirates, Jones won the 2017 Sunoco Rookie of the Year Award as a follow-up to his 2016 Indy Lights championship. Jones was the top rookie finisher in the 101st running of the Indianapolis 500 on May 28 in third, trailing winner Takuma Sato of Andretti Autosport and three-time champion Helio Castroneves of Team Penske. Jones started 11th in the 33-car field. “Chip runs one of the biggest and best motor racing teams in the world, and equally as important, is a proven winner across each series he competes in from Le Mans to Indianapolis and beyond,” Jones said. “I want to get up to speed quickly and learn as much as I can. Ganassi fielded cars fulltime in 2017 for Dixon, 2004 series champion Tony Kanaan, Charlie Kimball and Max Chilton. Jones, meanwhile, was teamed with four-time Champ Car champion Sebastien Bourdais at Dale Coyne Racing during the Frenchman’s injury-interrupted 2017 season. Jones won the 2016 Indy Lights presented by Cooper Tires championship for Carlin Racing with wins at Barber Motorsports Park in Birmingham, Ala., and the Indianapolis Motor Speedway road-course. He posted eight podium finishes along with eight poles before testing an Indy car with Rahal Letterman Lanigan Racing at Sonoma (Calif.) Raceway. Jones finished third in his rookie Indy Lights season in 2015 after competing in the FIA’s Formula 3 European Championship with Carlin in 2014. In 2013, Jones became the youngest European F3 Open Champion with six wins, 10 podium finishes and four poles. “It’s been a lot of hard work, you know, coming to the States, three years ago, racing in Indy Lights, winning that championship, rookie last year in IndyCar,” Jones said. “It’s been a very quick progression. I think everything has gone to plan, if not better than that. Jones reiterated he is eager to learn from Dixon, the 2008 Indy 500 champ and series champion in 2003, 2008, 2013 and 2015. Dixon will be competing in his 17th season for Ganassi in 2018, the longest tenure in team history. “Yeah, Scott is a legend of Indy car racing,” Jones said. “Been so successful over the years. He’s one of, if not the best, person you can learn from. So I’m really going to take advantage of that, try and scrape every bit of knowledge out of him and take it to my advantage. The wealth of resources in this team, it’s really going to be helpful. I think Scott is also a great guy off the track. Looking forward to working with him. “It’s going to be pretty tough. You know, it’s my second year. But I’ve been given this opportunity in the sense that they expect me to perform. That’s exactly what I plan on doing. I want to be able to work and be as useful to the team as Scott is. The aim is so that the pairing works well together and can improve both of us together. A product of the Mazda Road to Indy, Jones joins reigning Verizon IndyCar Series champion Josef Newgarden of Team Penske and Spencer Pigot of Ed Carpenter Racing as “poster children” for the developmental programs. Jones acknowledged that starting out with Dale Coyne’s Honda-powered team allowed him to get adjusted to the IndyCar Series. “I learned a huge amount,” Jones said. “I had another experienced teammate there in Sebastien Bourdais. To us, a season with Dale Coyne Racing, as a rookie season goes, it was very eventful. Obviously his injury came (crash during qualifying at IMS), had to leave the team for a while, then he came back at the end. Jones added he is eager to get acclimated to the Dallara-made universal chassis sanctioning body INDYCAR will introduce for the 2018 season for engine OEMs Chevrolet and Honda. “Yeah, I think the car, overall it has a lot less downforce, so it’s going to be a different driving style as to how the car was this year,” Jones said. “And so I’m really looking forward to that challenge. It should be more similar to the Indy Lights car in a sense, so that could help me. “In addition to that, for the whole team, it’s a new starting point. What makes this a great opportunity for teams, you know, for me to be with Chip Ganassi Racing, I think the team has one of the best resources out of the whole field. They’re going to have a great go at making the car perform really well from the get-go. It’s a perfect place for me to be at right now. “I’m really looking forward to how the car performs on the different circuits. On the ovals, it should make racing especially on the short ovals a lot better, at least that’s what everyone thinks is going to happen. That’s what I’m really looking forward to, how we can race better.